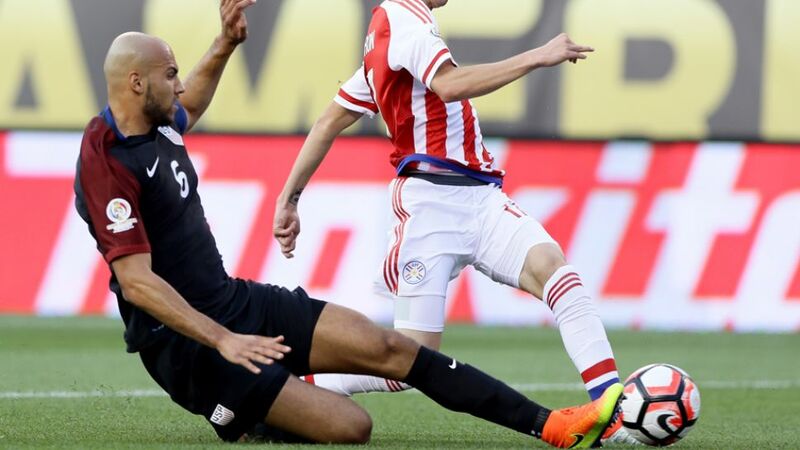 Hertha Berlin defender John Anthony Brooks put in a towering display for ten-man USA to help them book a place in the Copa America Centenario quarter-finals with a 1-0 victory over Paraguay. Buoyed by an impressive display to beat Cost Rica 4-0 in their previous game, tournament hosts USA started strongly against Paraguay. Nevertheless, they needed a huge tackle from Brooks – defending alone against three attackers – to stop them falling behind. The USMNT's dominance eventually paid off, however, when Clint Dempsey stroked the ball home from ten yards from a left-wing cross. At the other end of the field, FC Ingolstadt 04's Dario Lezcano had two excellent chances for the South Americans, but first his acrobatic header was well saved at the back-post before he was denied by goalkeeper Brad Guzan after running through on goal. The USA appeared to be in a comfortable position, but defender Deandre Yedlin's sending off early in the second half swung the momentum in Paraguay's favour. Hamburger SV newcomer Bobby Wood was a tireless presence up front and his contribution in preventing La Albirroja settle was vital to the USMNT seeing the result over the line. Jürgen Klinsmann's charges subsequently qualified for the next round, but Lezcano and Co will now pack their bags for home.